When I was offered the opportunity to try the Proactiv skincare range I said yes immediately. Like many I have seen the adverts and was intrigued. The older more wiser part of me knew that this was obviously a brand that uses a heavy celebrity presence for their marketing and it wouldn't actually make me look like Nicole Scherzinger, but it wouldn't hurt to try would it? Of course I didn't end up looking like Nicole but I did enjoy using the products and as they will be appearing in my June Skincare Empties post later this week I thought it was time to post my review. As I began formulating my review my concern was there is a very mixed opinion of Proactiv on the web with the likes of Caroline Hirons refusing to feature on her blog and should I? Much is discussed about their business practices, namely that when you buy their Introductory Kit you are enrolled in a program that seems difficult to get out of. As I received my kit directly from Proactiv I am not tied to any contracts with them so I cannot speak about that service and I will trust that anyone who is keen to tie themselves up into any program will do the necessary research. Today I will talk about the products only and my thoughts on them. 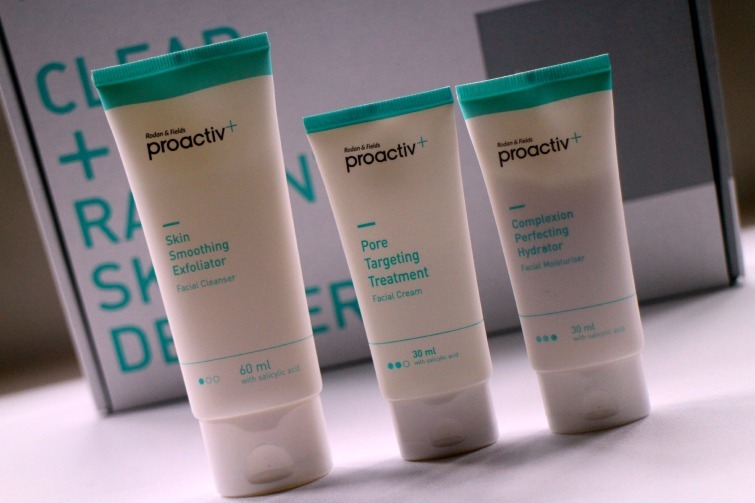 The Proactiv regime and introductory kit is a three step system and designed for oily, blemish prone skin. Essentially this a system designed for people, younger than me or certainly those with more skin concerns than I. I will say immediately that whilst I enjoyed the simplicity of this regime its certainly not enough for me nor the right ingredients I should be using on an ongoing basis for my skin concerns. I missed using a serum and I never thought I'd say that I missed the luxury of my multiple product regimes. I should also state that I did continue using an eye cream whilst following the three step system. Step 1 is the Skin Smoothing Exfoliator* to 'cleanse and smooth' the skin. Containing exfoliating beads, glycolic and salicylic acid you will gain a 'deep cleanse'. Did this clean the skin yes. Do I think if you have serious skin concerns and wear a lot of make up this would be sufficient, probably not. But I think this would be great for the guys or minimal make up wearers. I was concerned about this daily exfoliation but must say my skin did look fresh and brighter nor were there any dryness which I experienced with the La Roche Posay Effaclar Cleanser in their three step regime. It's also interesting to note that the exfoliating bead contents did remind me of an ESPA cleanser I was using on holiday recently. Step 2 is the Pore Targeting Treatment which is a thick gel as opposed to what would traditionally be your toner step. Slightly stick on application but not unpleasantly so this is their 'powerhouse' product, I guess what I would liken to the La Roche Posay Effaclar Duo. The formula or their 'Smart Target Technology' helps the salicylic acid to penetrate pores. Step 3 is the final step of your routine in the form of the Complexion Perfecting Hydrator. Again more salicylic acid appears in this product and it claims to leave skin smooth, supple, even-toned, bright and radiant. I fully expected to experience dryness after a day or two, or certainly a week or two of using these products but skin remained in good condition and I was pleased with the results. As discussed all products worked for me as advised. I didn't experience any new blemishes during use, nor did any new ones appear. Would I sign up for this regime? No but that is mainly due to my not being the target audience, nor someone with blemish prone skin. Can I see it's appeal for younger people, certainly and especially if you are suffering from the conditions discussed. Whilst I can't speak with authority on the terms of the enrolment program Proactiv offer I can see its benefits for ensuring products are delivered as required and you have a simple regime to follow. Can you find products on the high street containing the products mentioned? Yes but again if you're looking for ease and simplicity this may be the way forward. Of course this is a well marketed brand with buzz words and ingredients that they know will tackle the concerns for many a younger person but in my experience it did work and I can't argue that the products are true to their claims. Have you had any experience with Proactiv?